Today is Menu Plan Monday. 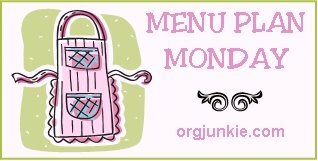 If you want to see others' menus for this week or post your own, head on over to orgjunkie.com. I cooked a lot of "base" foods and put them in the freezer over the last several weeks, so I will be using these to throw together quick meals. We have commitments every night during the week, so I am very grateful to have precooked, mostly nutritious food in the freezer. I am thrilled to have found so many tasty recipes that include dried beans and whole grains; these types of foods really help keep the food expenses down and are full of nutrition, and it is definitely a plus when the family likes the food (at least a little). These dinners are pretty frugal and healthful. I have a few favorite sites for really inexpensive recipes: Lentils and Rice (a new fav), The Family Homestead and Hillbilly Housewife. Sandwiches, something crockpotty, or something easy to throw together!